My parents were very loving and supportive of me growing up, and they gave me a great spiritual foundation to build from at a young age. But as young adult, I wasn’t quite sure what my purpose was. I knew that God created me, and that I was here for a purpose, but I didn’t know what that was, and I didn’t have anyone that spoke to me about discovering it, or living it out. I ultimately discovered my purpose through a lot of trial and error, life experiences, and most importantly, through seeking God’s voice and counsel through prayer, and through reading my bible. Your life’s purpose is not something to be taken lightly, or something to ignore. It’s important, not only for you, but for all of the people that you were put on this earth to bless and influence. When you discover your purpose, and live it every day, you feel fulfilled, and like you’re making a positive impact on the world, because you are. When you are living your life with purpose, you never run out of steam, because your purpose is God-ordained and God-designed, especially for you. Therefore, the strength to live your purpose comes from God, not just from you. What a blessing that is! But on top of that, God gives each of us special gifts, passions, and groups of people that we are supposed to positively influence in our lifetime. Your purpose is serious business, so don’t take it lightly, and don’t put off to tomorrow, what you can do today. My life’s purpose is tied to my passion for dance artists and passionate entrepreneurs. I am here to inspire, encourage, and motivate you to discover your unique purpose and greatness, while sharing the love of Jesus Christ. I am dedicated to helping dance artists and passionate entrepreneurs build a better quality of life, and be empowered with the tools, resources, knowledge, skills, and confidence, to build long-term wealth, and build a legacy. Everything that I’ve done in my life, from all of my jobs (the ones I loved, and the ones I didn’t), my business, all of my personal obstacles, life challenges, and victories, have all been for a divine purpose. Tera Carissa Hodges says, “Your process taught you how to lead others through theirs.” So here I am today, ready to offer you the motivation and inspiration you need to pursue your God-given destiny, and live your purpose, wholeheartedly, authentically, and without shame. – What am I naturally good at? – What do I do naturally, without even thinking about it (plan parties, connect people for jobs or relationships, help people with their kids, organize things, motivate people, make people laugh, teach other people, etc.)? – What do I enjoy doing so much that I am constantly reading more about it, learning more about it, and trying new ways to experience it? – What things do I see that upset me, or bother me, or drive me to want to take action, and do something about it? 2. Always Find Ways To Incorporate Your Purpose Into Your Daily Activities. Maybe you know that your passion and purpose are tied to teaching young children how to dance, and encourage their personal growth and self-confidence, but right now, you’re working in an office job, as a Salesperson at Macy’s, or as a Barista at Starbucks. No worries, find ways to still incorporate your life’s purpose into your daily activities, even if you’re not doing it as your profession yet. Write a blog about dance, geared towards kids, teens, and parents in your spare time, and stay connected to your purpose that way. Make YouTube videos offering tutorials, tips, dance lessons, or advice, to make sure you’re living your purpose every day. Get creative, and make sure that you’re always putting your skills, passion, and purpose to good use. 3. Don’t Grow Weary. If God has called you to do something, He will provide you with the grace, the strength, and the resources to do it. Period. Don’t let obstacles hold you back, discourage you, or get in your way. Remember that, when you get tired and weary, and are tempted to let your fears or challenges hold you back, many people are affected by that decision, not just you. So many times, after sending out my weekly e-newsletter, or posting an inspirational message on Facebook, I get an e-mail or comment from someone saying that they really needed to hear what I said, or, that it really encouraged and uplifted them. That is why I do what I do. Be motivated by the positive impact that you are destined to have on the lives of others, when you feel like giving up, be encouraged to persevere through challenges every day. 1. Write down your answers to the questions that I listed above related to discovering your purpose. 2. Write down a personal mission statement, and keep it somewhere that you can see it, and refer to it on a daily basis. Share it on your social media profiles, and on your website/blog. 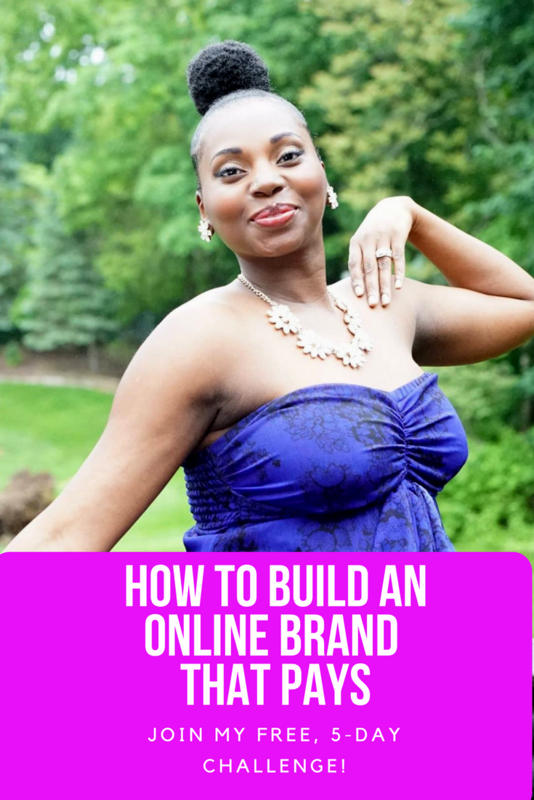 If you own a business, write a mission statement for your business, and post it on your website and blog. 3. Share your life’s purpose with a few people that you trust, and encourage them to do the same. Create a network of friends (in real life, and on social media), that will empower and encourage you every day to live your purpose, in all that you do. Post a comment below telling me what you believe your life’s purpose is, and when/how you discovered what it was. Share what resonated with you from this post, or what your “A-Ha” moment was. 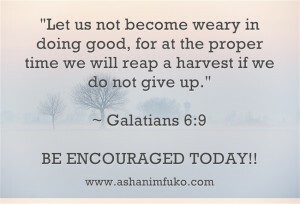 “Let us not become weary in doing good, for at the proper time we will reap a harvest if we do not give up.” ~ Galatians 6:9 — Be encouraged today! Welcome to my blog! 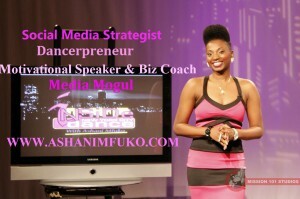 I’m Ashani Mfuko, Social Media Strategist, Business Coach, TV Host, and Dance Entrepreneur. Today I am going to share some very valuable advice with you on, “How To Stay Strong and Positive During Difficult Times & Life Challenges”. God has been so good to me! Even through all of my trials and difficulties, I am a living testimony that you can overcome sadness, depression, discouragement, and despair, by the power of His name. I want you to know that, all of my advice, and tips, are based on biblical principles, so you’ll hear me reference scriptures from the bible that relate to what I’m talking about, throughout my blog posts here. All that I am, and all that I am able to do, stems from my faith in Jesus Christ as my Savior. He is the foundation of my joy, peace, and my life, and I’m so glad that I don’t have to go through life on my own, and in my own strength, as a result of my faith. On that note, let’s delve into some of the challenges we all face on a day-to-day basis, and my 3 power tips for staying positive and overcoming your life challenges. 1. Daily Challenges: Examples – leaving your keys in the car, missing the train for work, being overlooked for a raise at work, or rejected from an audition, having a sick child, a minor car accident, or getting surprised by an unexpected expense. 2. Major Life Challenges: Examples – the death of a loved one, a major sickness or serious injury, losing your home, being evicted from your apt, or the end of a serious, long-term relationship. 3. Extended Life Challenges: Examples – chronic pain or illness, unemployment, debt, finishing your higher education, waiting for your prayers to be answered, making major life changes (like overcoming an addiction, or unhealthy lifestyle or relationship habits), the journey to pursuing your dreams and goals, or starting your own business. Faith and trust in Him, patience, gratitude, empathy and compassion, and a desire to live our lives His way, based on His word, not on our own selfish desires. All of the challenges we face each day, can develop these qualities in us, if we allow God to do the work that only He can do in our lives. In my Motivational podcast entitled, “How To Live Your Purpose With Passion, Patience, and Perseverance”, I talk about how God calls all of us to: “love the Lord your God with all your heart and with all your soul and with all your strength and with all your mind’; and, ‘Love your neighbor as yourself. '” ~ Luke 10:27. 1. Start the day right. Prayer, Bible, Meditation. If you have a journal, write in it. Write down what you are thankful for, and a some of the blessings that you currently have in your life.This can be anything from: “Thank you Lord for clean, running water, for heat, for being able to breathe, see, smell, and touch. Thank you for the ability to walk, for my food, clothing, and shelter, an dfor where you’ve brought me from , and what you’ve brought me through”. Let your first thoughts of the day be positive ones, and thoughts that uplift, empower, and strengthen you for the day ahead. Let go of disappointments and failures from the previous day and focus on all that is wonderful and positive about your life. Get centered, and let God give you divine guidance and strength to tackle the day ahead. Connect with inspirational and positive people on social media, so that your spirit will be filled, and surrounded with positive energy, all day long. 2. Know That There Are Seasons In Life, & Your Tests and Trials are Temporary. When you’re going through tough times, it can feel like they are never going to end, i.e., you’re never going to get over that ex, you’re never going to get out of debt, or move into a larger home, or a better neighborhood, or that you’ll never get the victory over an area of your life where you’ve failed time and again. But that’s simply not true. “There is a time for everything, and a season for every activity under heaven:” ~ Ecclessiastes 3:1 Just like the seasons of the year, winter, spring, summer, and fall. They begin, and they end. I was talking to a woman at church last week, who’s a new mom, about child birth, and she said something to me that really stood out. She said that the pain of labor and delivery is easier to bear if you just flow with it, instead of trying to resist it, or fight it. That really resonated with me, because it’s the same with our life challenges. When you take your worries, problems, and difficulties to God in prayer, and actually leave them with Him, and not try to take them back, he gives you perfect peace. And even though you still have to experience the challenges, you have confidence that God is still in control, and that things will eventually work out, and get better, because God has promised that to you. 3. Be aware that you will have negative thoughts and feelings of self-doubt from time to time, and be prepared with the proper action steps to overcome and combat those thoughts immediately. For every negative thought you have, think of three positive ones. For every one thing that you think is wrong in your life, think of three things that are going right. Your mind is a muscle, and it’s up to you to strengthen it, and train it how to think, respond, and react to challenges. Keep your thoughts positive, and your mouth will follow. “Death and life are in the power of the tongue, and those who love it will eat its fruits. “ ~ Proverbs 18:21. When in doubt, refer back to your purpose, and know that your presence is needed in the world, and no one else can replace the unique value that you have to offer. The purpose and passion that you feel in your heart is there for a reason. Remember that you are a gift to this world, and your voice, your talent, and your unique perspective is of high value. Your presence on this earth will change lives, and could possibly save someone’s life. Write down all of the challenges that you are facing today, and all of the things that are bothering you/stressing you out. Now, write down all of the things that you are thankful for in your life, and write down three different instances where you went through a difficult time/trial, only to experience success and God’s faithfulness thereafter. Say a prayer, and thank God for His faithfulness, and for all that He is about to do in your life, and in the life of your loved ones. Encourage someone else today who may be going through a difficult time, and post an inspirational quote, or bible scripture on your Facebook page to uplift the people in your social network. Post your comment below, and tell me what resonated with you, or what your “A-Ha” moment was.